Shriver brothers, Andrew and David Jr., sons of Rebecca Ferree and David Shriver Sr., bought a large tract of land in Carroll County, Maryland, at the junction of Pipe Creek and Deep Run. On January 25, 1797, the brothers contracted with a millwright to build a set of mills - a grist mill and a saw mill. They later added a tannery, cooper shop, and a blacksmith shop. Because of the partnership of the two brothers and their various businesses, this settlement and the area around took the name "Union Mills". The same year the mills were being built (1797), construction also began on a residence for them. A contract was made to build two small houses 14 X 17 feet each, to be connected by a porch and a passage about 10 feet wide. Each house had one upper and one lower room with a connecting hallway and a small porch in front, 12 X 8 feet. The total labor costs for the house came to $86 dollars. 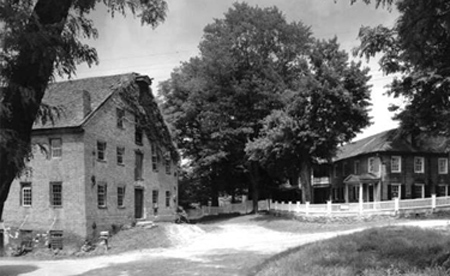 David Shriver relinquished his interest in the mill in 1803 to accept a position supervising the construction of the Baltimore-Reistertown Turnpike. Andrew Shriver was born in 1762 and died in 1847. Married Elizabeth Schultz. David Shriver, Jr. was born in 1769 and died in 1852. Married Eve Sherman. Their lineage: Andrew Shriver & Elizabeth Schultz and David Shriver, Jr. & Eve Sherman/David Shriver, Sr. & Rebecca Ferree/Abraham Ferree & Elizabeth Eltinge/Philip Ferree & Leah Dubois/Daniel Ferree & Marie Warenbur. Sources: "The Building of the Shriver Homestead", The Union Mills Homestead website www.unionmills.org; Carroll County, Maryland Department of Tourism www.carrollcountytourism.org. The 1950 photo above can be found on the Union Mills website photos page created and maintained by J. Douglas Klein.